WEB leaders Rylie Dupuis and Ansley Nordberg lead activities for sixth grade mentees. POLSON – Teacher Tessa Hupka stood before a class of eighth graders that seemed to be like any class on the first Friday of the school year: full of students chatting, joking, and rifling papers, but Hupka wasn’t there to teach math or reading. Each student in the room was selected as a leader for the Where Everyone Belongs (WEB) program. 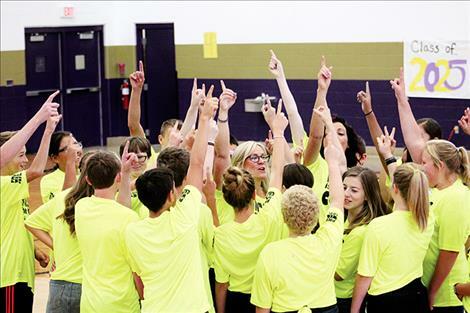 Each eighth grade leader was selected to mentor a group of sixth graders throughout the year. The goal was for the older students to help the younger students feel included as they adjust to their first year of middle school. According to Hupka, the program is already working. The 29 eighth grade mentors started the year off by facilitating an orientation for the sixth graders. 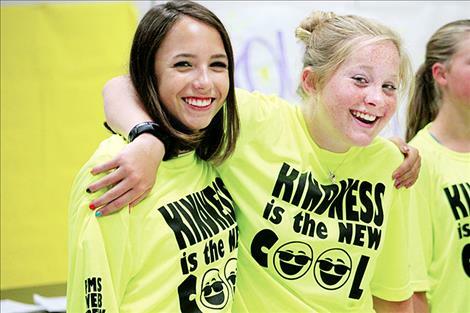 At the orientation, sixth graders met their WEB leaders and participated in activities to build relationships and provide tools for succeeding in middle school, and 114 of the 142 sixth graders attended the orientation. WEB was created by the Boomerang Project, an organization that designs programs to support students as they transition into high school and middle school. WEB is implemented in schools around the country. The WEB program trains teachers to lead the mentorship program and gives them a structured curriculum to implement throughout the year. It was Tim Finkbeiner, Polson Middle School principal, who decided to implement the program in the school. “He saw a need for having a systematic sort of mentorship program in our school to help sixth graders belong in our school,” assistant principal Jesse Yarbrough said. Yarbrough said that the program is backed by research that shows that positive relationships with older students in school increases the chance that students will feel a sense of belonging during the often difficult transition into middle school. The administration chose teachers Nicole Camel and Hupka to facilitate the WEB program. The two attended a three-day training in California in April to learn how to implement the program. “It was the best training I’ve ever been to in my career,” Camel said. Camel appreciated the hands-on activities and “deep messaging” about community building, mentorship, and peer influences featured in the program. In the midst of a classroom discussion in the WEB class, the phone in the classroom rang. It was the school’s office calling to request that one of the WEB leaders give a new fifth grade student a tour of the school. Hands went up around the classroom. “I’ve seen people giving individual tours and I’m like, ‘I want to do it!’” one student said. Giving tours to new students is a duty that the WEB leaders will be responsible for throughout the year. Hupka said that staff members selected WEB leaders who demonstrated kindness and leadership. Hupka and Camel chose WEB leaders from diverse backgrounds and social groups. The student leaders attended a two-day training before the start of school to learn skills for welcoming their mentees into the school year. Throughout the school year the leaders will provide social and academic support for their mentees. WEB leaders will have a social event with their mentees twice per month. They will attend a school dance with their mentees, hold an ice cream social, and check in on their mentees academic status. Yarbrough said that an “unforeseen” benefit of the program was “the interpersonal growth and social development” that eighth grade WEB mentors demonstrated as a result of their training. “Even if we fell on our face and didn’t work for sixth graders, what these eighth graders have gotten out of this program may be enough to keep it,” he said. Eighth grader Grace Simonich is one of the WEB leaders. She said that she was a good candidate to be a WEB leader because she likes to help other kids, and she’s known in the school for being positive. Simonich said that she hopes that as a WEB leader she can support students who are in a position that she remembers well. “In sixth grade I felt smaller than eighth graders, and not welcome.” She said that it felt good to support her group of sixth grade mentees during the orientation. Simonich has clear goals for her relationship with the sixth graders she will mentor. “I want kids to feel happy at school and to get them on task because I know it’s kind of hard to be a middle schooler,” she said.